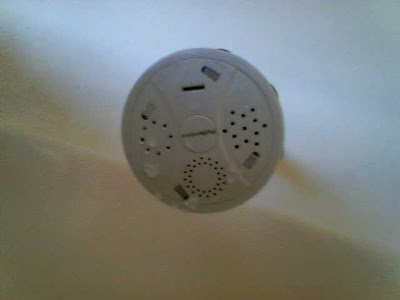 The below showerhead damn near killed me in the bathroom of the Sands Motel. Notice how the different-sized holes exist around the fixture's perimeter rather than in the center where the water normally comes from. This causes innocent motel tenants like me to rotate the fixture in a vain attempt to figure out why their shower seems lopsided. Do you see the Star of David-shaped spout at three o' clock? That's the mist function. It spews out molecules of water in no fashion that resembles a shower. The mist was so fine, in fact, that most of the water rose vertically over my head, bedewing everything in the bathroom but me. The Jews should be angry. See the rectangular slot at noon? It takes the ineffectiveness of the mist function and channels the shower's total power through that hole. It shot me directly in the eye, which knocked me back, and then it drilled me directly in the chest until I could muster the strength to kick off the faucet. Yes, just like that one Seinfeld. It left a red mark on my chest. The next photo is of a perplexing sign in the bathroom mirror. 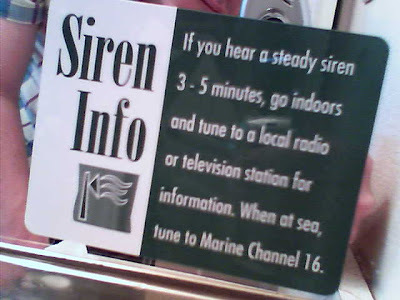 Not only does it concern me that I could hear a continuous siren for three, four or five minutes, but I'm downright terrified that my motel bathroom could have somehow been at sea or could soon become at sea. Next, a cardboard cutout advocating fossil fuels. 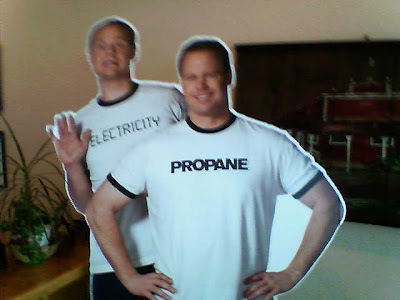 This cardboard cutout of a beefy personification of propane standing in front of a cowering personification of electricity stands in my dad's office. My cousin decided to point out that Mr. Weenie Electric Power kind of looks like me. Even worse: I think she's right. Still, what bothers me most about this display is that the maker didn't design Mr. Propane with space in the loop his left arm is making. Finally, we ate at the airport restaurant in Hollister. 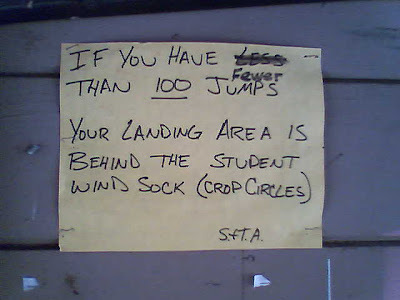 I took a look around and saw the below sign posted outside the former office of the sky dive center. I guess there's nothing necessarily funny about this sign, really, but on some level I'm still amused by the notion of someone choosing to grammar check a sign that is theoretically preventing death. It's like this: The sign tells parachutists where they need to land — a bit of information that could be fairly useful when you're plummeting to the ground — but somebody came by and decided to make the sign slightly less easily readable by crossing out "less" and writing in "fewer." Oh, and then there's the weirdness of telling people to land in an area that can be identified as being both "behind the student wind sock" and "crop circles," the latter of which is a phenomenon I associate primarily with UFOs and not aerial safety. And, of course, the phrase "wind sock" is just inherently funny. A sock made of wind? Can you imagine?